Ella Rhodes reports on research by Dr Robin Carhart-Harris and Professor David Nutt, and next steps. The first fascinating images of the human brain on LSD have sparked hopes for its potential use therapeutically in the future. The work, supported by the Beckley Foundation, which looks into the effects of psychoactive substances, has shown reduced segregation between networks in the brain leading to apparently better communication and connectivity across the brain while under the influence of the drug. The study, led by Dr Robin Carhart-Harris alongside Professor David Nutt, saw 20 participants being given LSD intravenously on one day and a placebo on a different day. 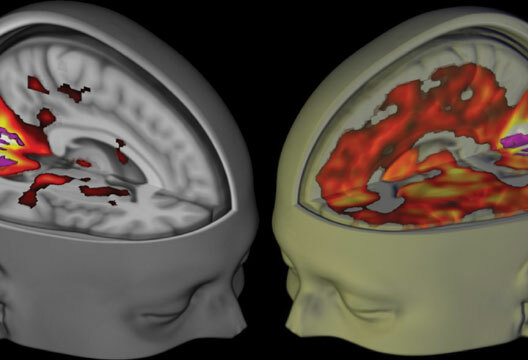 All participants had previous experience with psychedelic drugs and were scanned using three methods: MRI, arterial spin labelling and magnetoencephalography. Images from the study suggest a greater connectivity across the brain as well as evidence that the visual hallucinations produced by the drug involve not only the visual cortex but many other parts of the brain. This lack of ‘boundaries’ between brain networks that are usually highly segregated may suggest a mechanism behind the altered state of consciousness experienced by users and the ‘ego dissolution’, or loss of a sense of self, described by many. Nutt and Carhart-Harris spoke to The Psychologist about the implications of their work and future directions of study. Nutt compared this discovery to that of the Higgs boson, explaining: ‘It’s like the boson discovery in several ways – both were identified as highly significant to their field in the 1960s, both have taken 50 years to come to fruition, and both have proved game-changing in their respective arenas. LSD results have fundamentally altered our understanding of the brain locations and mechanisms of the different states of consciousness seen under psychedelics.’ He added that future studies will explore whether there can be long-lasting changes for the benefit of the participants, perhaps in personality or mood, and to look into potential uses in addiction treatment. - For more on hallucinogens, see our special issue.